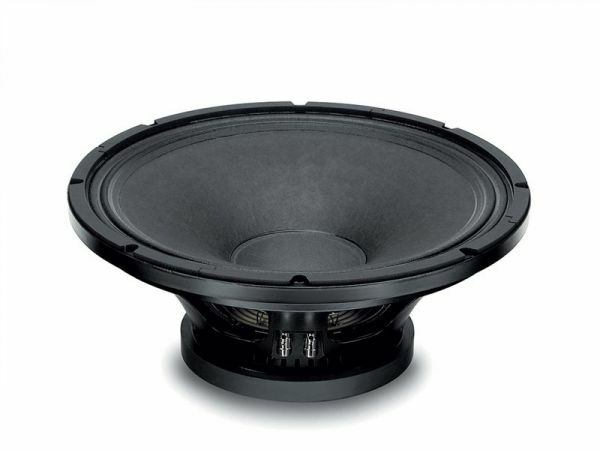 Produktinformationen "18s 15MB650 8 Ohm"
(101dB 1W/1m) with high power handling capabilities. The curvilinear paper cone, in conjunction with the viscose dampened double half-roll suspension, provides excellent transient response and cone damping. The 75 mm Ø copper voice coil utilises the same technology fitted to our top-of-the-range 4” voice coil models. It employs the Interleaved Sandwich Voice coil (ISV), in which a high strength fiberglas former carries windings on the outer and inner surfaces to achieve a mass balanced coil. This results in an extremely linear motor assembly with a reduced tendency for eccentric behavior when driven hard. The low inductance coil gives improvements in transient response. Excellent heat dissipation has been achieved by incorporating air channels in the basket design, between the basket and top plate. Maximum flux concentration and force factor in the gap are assured by the unique shape and design of the face and back plates, which have been created using our in-house Magnetic Flux FEA CAD resource. Weiterführende Links zu "18s 15MB650 8 Ohm"
Kundenbewertungen für "18s 15MB650 8 Ohm"